How novel to imagine that youngsters aren’t novel. The title of this entry is an English translation of the name of a German article appearing on August 6 in Spiegel Online. I don’t read Der Spiegel, the largest German newsweekly, in German or in English. Fortunately my friend Bob McArthur does, and brought this to my attention. Could this be possible? You mean they don’t have secret decoder rings? The article is based mainly on some new research out of the Hans Bredow Institute entitled Growing Up With the Social Web. The presentation is available online, but only in German. 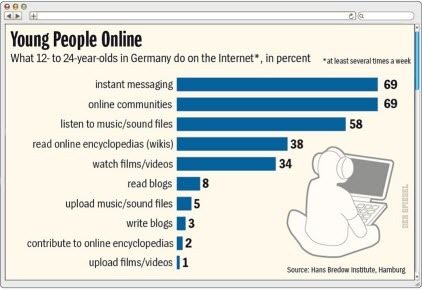 Spiegel offers a single chart in English. A small group of writers, consultants and therapists thrives on repeating the same old mantra, namely that our youth is shaped through and through by the online medium in which it grew up. They claim that our schools must, therefore, offer young people completely new avenues — surely traditional education cannot reach this generation any longer, they argue. There is little evidence to back such theories up, however. Rather than conducting surveys, these would-be visionaries base their arguments on impressive individual cases of young Internet virtuosos. As other, more serious researchers have since discovered, such exceptions say very little about the generation as a whole, and they are now avidly trying to correct the mistakes of the past. My restatement of the piece would be “Digital non-natives make the same error made by explorers throughout history: both ennobling the savage and at the same time demonizing him.” Turns out the native is human, just like you and me. And s/he doesn’t think that foraging, hunting and “native” dances are remarkable. Of course consultants like Don Tapscott and Marc Prensky feed us the charismatic guru’s diet of what we want to believe: that digital natives(quite a good term: the secret to success for gurus is coining terms like this and making them sticky) are a superspecies, i.e. able to find technology to be somehow commonplace in a world full of frightening marvels. They (and we) did not consider that for the natives the marvels are completely taken for granted, thereby losing all mystical powers. What remains are the day-to-day social concerns of all teens, made somewhat simpler to navigate with texting, Facebook, etc. And as always, there is the challenge of learning to use educational tools — whether textbooks or computers & wikis — as effectively as possible. Just because kids grew up with technology doesn’t mean they know how to use it well. And their elders were previously in no position to offer credible advice. I’ll be interested to see how long it takes for this notion to penetrate the U.S. media. I think that the big media that dominate the dialog and the vendors they serve have a vested interest in clinging to Tapscott & Prensky’s anthropological myth-making. People and companies spend big bucks on the extraordinary. Everyday utensils don’t command a price premium. 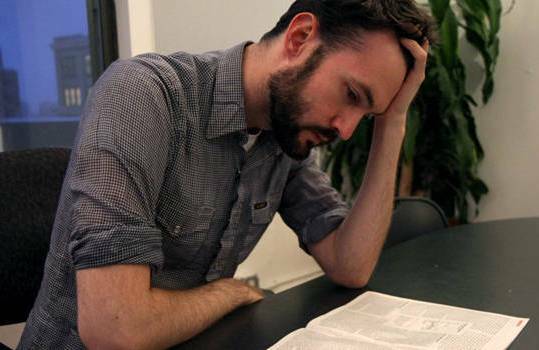 The source is most reputable: The Pew Research Center for the People & the Press. Well I guess they was warned! And based on the continuing river of despondency and desperation from news organizations, I don’t imagine that we’re not going to see a change any time soon. And, I must now admit, perhaps never. My naysaying, dancing-on-the grave-type friends and colleagues point out that the chicken is only coming home to roost. Newspapers, during the many heady years that preceded this shakeout, developed some deplorable business practices. But there was enough cash in the coffer that they could do just about whatever they pleased. It was Roy Thomson, the founder of the Thomson publishing empire (now in the hands of his grandson) who first described television as “a license to print money.” A press baron also, he knew well how money was printed. A popular Web site is the new license for printing money (although not for all). And newspaper owners failed to get on the bandwagon in time to obtain their licenses. I feel sympathy for the owners and managers: are any of us so clever that we would have done much better? I feel great sorrow for the ever-increasing ranks of reporters, lower-level managers and production personnel who must bear the brunt of this downturn. But of course, as the newspapers remind us each day, in print and online, those workers are not alone.